How small is their garden? 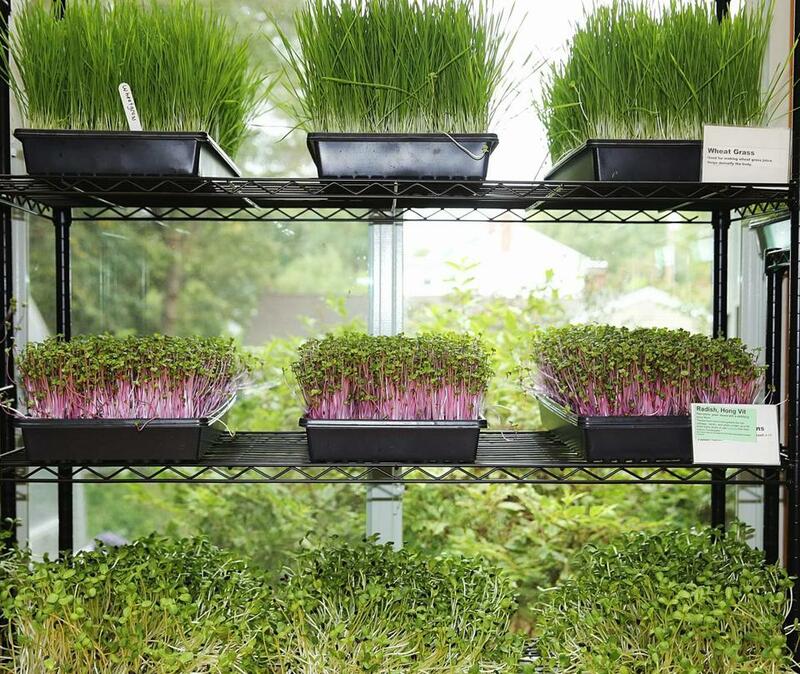 Trays of wheat grass, Hong Vit radishes, and sunflower sprouts in Tim Smith and Lisa Evans’s Roslindale greenhouse. Most farmers rely on a barn full of heavy equipment — tractors and plows and combines — to get the job done. Tim Smith and Lisa Evans’s most important tools are stored in a cup on the kitchen counter. Smith and Evans, urban farmers growing microgreens in Roslindale, require only sharp scissors to harvest their crops. The greens go from seed to market in about two weeks. They don’t need abundant water or acres of land; they’re grown in trays and stacked in a greenhouse or sunroom. They might just be the perfect urban crop. The couple launched We Grow Microgreens last January. They offer more than a dozen varieties of tiny greens, including sunflower, radish, amaranth, kale, and broccoli, sold in pints (about $4) or in a good-size salad mix ($8 to $10). The greens, an inch or two high at harvest, have stems that range in thickness from thread to string and are cut and consumed in what is called the cotyledon-growth stage, when the first two or four tiny leaves appear. They’re almost too small and delicate to separate into individual plants and are usually eaten by the handful. Smith, 43, and Evans, 45, are former Boston Public Schools teachers. Evans still teaches part time at the Ivy Street School in Brookline, a private alternative school; she also works part time as an instructor with the Massachusetts Department of Education. Smith attended Boston College Law School but decided against a career in law and turned to teaching instead. But weary of what Smith — an avid gardener who also grows tropicals and novelty plants for fun and extra income — calls “the jungle of teaching,” the two became interested in urban farming as a next career. They continue to try to acquire land for farming in Boston, but they soon came to accept that the best place to start would be their own backyard. Faced with the realities, logistical and regulatory, of what could be done in a small yard, says Smith, “We said let’s start small, with microgreens.” They had already built a sunroom on their house for growing lemons and limes, and that south-facing room became their first “field.” In the spring, Smith and a friend built a greenhouse and the business expanded accordingly. The couple also plans to build a greenhouse at their summer home in Maine and add to their crops from that space. They started selling at farmers’ markets, where they soon discovered that not everyone is clear on what a microgreen is. Smith explains that microgreens are an outgrowth (as it were) of the sprouting craze of the 1960s and ’70s, when many folks simply threw seeds into a Mason jar with a bit of water and let them sprout, then pulled out the “crop” to use in salads, sandwiches, and more. But sprouting got a black eye after a few well-publicized incidents of bacterial contamination and resulting illnesses, even death. Microgreens are similar to sprouts but grown in a way that minimizes the possibility of contamination. The seeds are sown in flats, either in soil or another growing medium. Without the moisture and confinement of a jar, there is less opportunity for bacteria to spread. 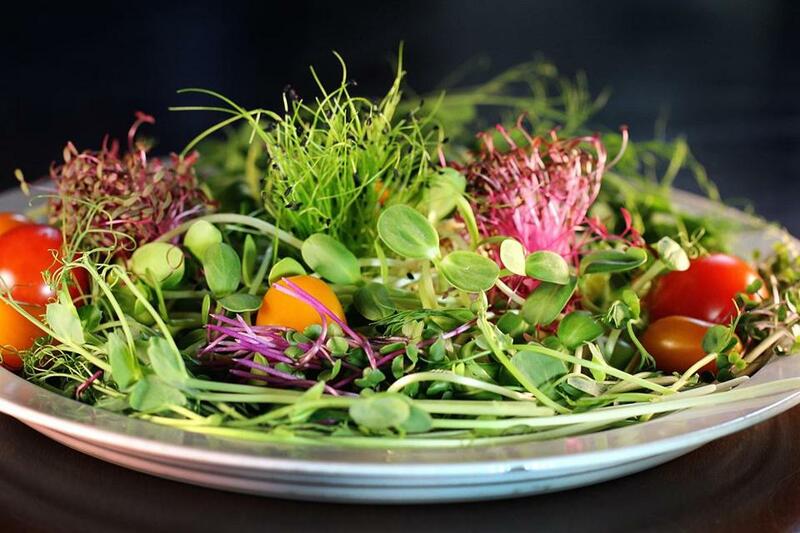 Some studies have shown that microgreens have a higher nutrient content than mature plants. Smith cites a 2012 University of Maryland report in which researchers found certain microgreens contain up to 40 times the nutrients of their mature counterparts. Many of Smith and Evans’s customers are interested in the nutrition value of sprouts, but others simply enjoy the delicate texture and flavors of the dainty greens. Some of the products, such as golden pea shoots (raised in the dark to keep their pale color), are enjoying a certain vogue among chefs, and the couple counts a few local restaurants — including Masona Grill and West on Centre in West Roxbury, Walnut Grille in Newton Highlands, and Comedor in Newton — among their customers. “Like any other small business,” says Evans, “we’re working hard to make it work.” Signing up restaurant and retail clients has helped them turn a profit. The Roslindale backyard that’s home to We Grow Microgreens is a lush urban oasis. Behind the house is conservation land, and Evans says she’s seen blue herons, deer, skunks, fisher cats, and coyotes on the property. The sound of a miniature waterfall trickling over rock ledges fills the air; the stream is man-made, feeding the large koi pond that Smith built several years back. Inside the greenhouse, trays of tiny greens are layered on racks, the 2-inch plants just about ready for harvest. They’ll be cut at soil level with a sharp, sterilized scissors, and packed for sale into clear, hinged plastic clamshells (like takeout containers) in two sizes. A salad made from their crops includes red garnet amaranth, pea shoots, chives, sunflower shoots, Hong vit radishes, and kale. 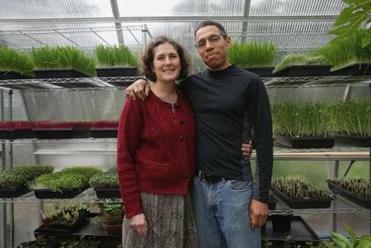 Growing microgreens on a commercial scale has its challenges, the couple say. Crops come along quickly, and while that means there are always greens to sell, the schedule requires careful planning and precise timing, especially for a crop whose peak shelf life is three or four days. The couple plan their harvests around farmers’ market schedules and the needs of the retailers they supply; they keep those scissors handy at all times. WE GROW MICROGREENS are available at Volante Farms, 292 Forest St., Needham, 781-444-2351; Harvest Coop, 3815 Washington St., Jamaica Plain, 617-405-5300; Bacon Street Farm, 100 Bacon St., Natick, 508-653-4851; Fruit Center, 10 Bassett St., Milton, 617-696-5274, and 79 Water St., Hingham, 781-749-7332; and at farmers’ markets in Natick and Roslindale on Saturdays (year-round) and at Russell’s Garden Center winter farmers’ market in Wayland on Saturdays; or go to www.wegrowmicrogreens.com. Jane Dornbusch can be reached at jdornbusch@verizon.net.